This is the Pro Boat Blackjack 24-Inch RTR Catamaran Boat, with an included Pro Boat 2.4GHz Radio System. Want to experience all catamaran boating can offer at full-throttle? Then look no further than the Blackjack 24. From its deceiving size down to its distinctive trim scheme, the Blackjack 24 comes ready to be your ace in the hole and to deliver the RC boating action you crave. 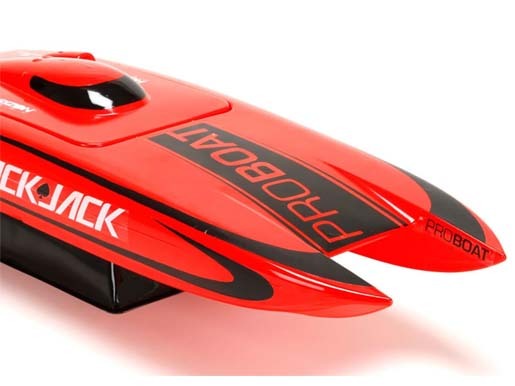 Equipped with a formidable 2000kV water-cooled motor and action ready LiPo compatible 30-amp ESC, this 24-inch catamaran is sure to turn heads with the kind of power and speed that no one will see coming. 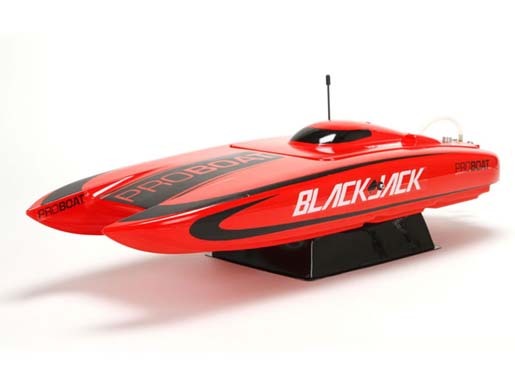 So go all in, raise the stakes and claim your bounty with the Blackjack 24 catamaran. Others: Prop: 1,34 x 2,06"